Zhambyl Zhabayaev is a Kazakh poet-akyn, one of the brightest frontmen of Kazakh oral folk art. 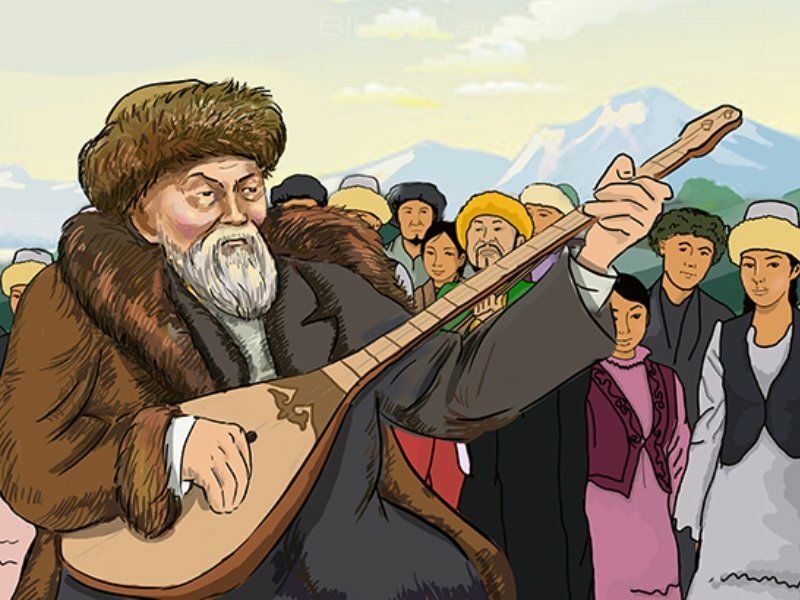 Due to his phenomenal memory, Zhambyl knew the words of akyns including tens of thousands of lines of various poems, both Kazakh and other peoples of Central Asia. As a teenager, Zhambyl learned to play dombyra. At the age of 14 he decided to leave home and become a singer. In the choice of Zhambyl his way of life, an important role was played by the well-known during in the 60s of the 19th century. The work of the famous poet Zhambyl Zhabaev developed under the conditions of acute political events that covered Kazakhstan in the early 20th century. Since childhood, actively taking part in steppe poetic competitions - aitys, Zhambyl perfected his talent as an improviser. His work was marked by an acute social orientation, expressed in exposing the tyranny of large feudal and royal officials. The humanity has always been looking for a path to perfection. Zhambyl sincerely believed in the inevitability of the victory of light over darkness, good over evil, and therefore took the hotly revolutionary changes of 1917, the Soviet government with its optimistic slogans. The poems of Zhambyl about happiness seem sometimes simple, even naive. But they are infected with an ineradicable love for the people, singing the brightest and clearest in human life - work, love, native land, the pursuit of happiness. And so the songs of Zhambyl were remembered by a lot of people, subduing the masses with genuine humanism, prompting even the most spiritually depressed individuals to live. And it does not matter that his dreams of bright days did not find an instant embodiment. They have sparked in the souls of people sparks of good. He remembers the covenants of the ancestor and Nursultan Nazarbayev, inspiring Kazakhstanis with the idea of ​​a bright path - "Nurly Jol". To show tolerance to each other, while remaining loyal to their land, patriots of their country, is this not the same Milky Way where Zhambyl's dreams come true. That's why it's time to write his biography again, analyzing, first of all, the cultural layers discovered by the historical dives of akyn. For the biographies of outstanding personalities are a real value for the cultural matrix, the same code of memory that comes to us from the depths of millennia, "the author of the book notes. In the first part of the book "The Philosophy of Steppe Battles" describes the childhood of akyn. Zhambyl, Zhabai's son was born on February 16 in 1846 in the Kazakh steppe near the Zhambyl mountain near the Chu River. Now it is Moiynqum district of Zhambyl region of Kazakhstan. My father was a poor nomad cattleman. The boy lived in a yurt and, together with his family, constantly moved from nomad camp to a nomadic camp. Uncle Zhambyl played well on dombra. By the age of 12, Zhambyl was addicted to this Kazakh folk instrument. Zhabai, the father of Zhambyl, gave his son the name of the mountain. In groans and torments she bore me. The Kazakhs gave me the name Zhambyl. Memories of Zhambyl about childhood - this is a story in general about the nomadic way of life: "As a child, I have never seen fields, gardens, or irrigation ditches. The steppe was my homeland. Everyone who surrounded me, roamed and fed from cattle. Our steppes bordered on the Kyrgyz. It is reported that Father Zhabai was among the most brave zhigits in the campaigns. I grew up in a yurt. Like all Kazakh children, I was transported from the nomad camp to the nomad camp along with the cradle." According to relatives and friends, who later were kept in family legends, Zhambyl grew up as a living, restless, independent boy. He was a ringleader in many games, children's tricks. He liked crowded aul festivals, clan gatherings, where the kid got with adults. Speeches, disputes, conversations of the elders were postponed in the memory of children, adding to it every time new bits of knowledge from the treasury of the Kazakh language. He loved to visit the father of the herdsmen, where he immersed himself in the unique atmosphere of nomadic life.The boy who was growing up was entrusted to graze sheep. The boundless steppe, with its expanses and secluded corners in the intermountains, dells with multicolored grasses and flowers, was fueled by his childish imagination. Written sources about childhood and youth Zhambyl there, except for the memories of the akyn and art works about him. Zhambyl did not receive any education. There was simply no school. Father Zhabay gave it to the teachings of the aul mullah when he was 8 years old. But the mullah's lessons were remembered only by educational methods. Mullah made the children learn the suras of the Qur'an with the help of whipping. Akyn himself did not often think about childhood. In the diaries of his literary secretary Gali Ormanov (1907-1978) there is such a record, dated 1941: "It was a time when I began composing the first songs," Zhambyl recalled. "My father sent me to the mullah to study." We were at the zhaillyau. I came to the mullah. When I stepped over the threshold, I felt as if I had entered a tight cage. After the lessons he immediately dived into the forest thicket and disappeared. Yet they found me". In 1937 Zhambyl told the Soviet Soviet poet Tahir Zharokov: "In good conscience, I did not understand this mullah. He could not really explain even Arabic graphics. How I regret that as a child, there was no one to really learn.'' The impression of the educational methods of the mullah was so strong that Zhambyl used history as an argument in subsequent disputes with his father. Since the age of 15, he devoted himself entirely to poetry and began to travel around the auls along with older akyns. Most often took him with a famous Suyunbai. Zhambyl was 27 years old, when he met on one occasion on the Zhailiau Kulansaz with Burym, a girl from the genus Aykim. Burym possessed a remarkable singing voice and stood out with extraordinary beauty, - the author writes in the first part of his book "The Philosophy of Steppe Battles". - Brown in translation from Kazakh - a scythe. In fact, two braids descended from her shoulders, like two rivers. The eyes shone like the smooth surface of lakes, the speech streamed like the clear waters of a mountain river, the gait was light, like the movements of fallow deer. Zhigitov did not recognize, none of them could adequately reflect her keen word, all were worn out and retreated. The first girl with whom she agreed to compete in singing was Zhambyl. Both were young, their speeches were burned with flame, in each vein the irrepressible inner power of akyn. Taking dombyra in their hands, they entered into a silent dialogue in the form of kayim-aitys (kayim - improvisation song of two partners who constantly repeat the first two lines of the poem), questioning each other in a friendly manner about the affairs. Only then did the conversation turn into a major dispute. It was their first meeting. About love was not said a word: in public, the young akyns had no right. The subsequent meetings also took place in the form of aitys. However, Zhambyl and Burum did not have a goal to win at any price. Over time, the protracted aytys exhausted itself, for there was complete agreement between the young people, there was nothing to argue about. And it so happened that they fell in love and could no longer live without meetings. Parting seemed a grief, a long-awaited meeting at dawn - happiness. But then the relatives of the groom Burim became alarmed. According to the Kazakh tradition, she was identified as a child by her husband's choice from the Shybyl clan. Since ancient times, in Kazakh families, girls have been married beforehand, by mutual agreement between families, getting a kalym - a solid kush. Thus, women's family happiness was guaranteed. But there were unforeseen dramas when the girl did not want to live with an unloved person. Native Buram began to prepare her for the wedding. Stop preparations and cancel the wedding could only be bought by the bride, and then with the consent of all parties concerned. But Zhambyl did not have the money to do it. He was worried, not finding an opportunity to change circumstances. Realizing that he could lose his lover forever, he decided to run away with her. Zhambyl brought the girl to the aul of her patron, beating Sarybai, the elders of the clan, deciding to submit to his will, hoping in his heart for help from the biy who gave him his bata to sharpen his poetry skills. Aul was preparing to withdraw from the zhailau and to go to the place of autumn shearing of sheep. Zhambyl settled the Brown in the house of Sarzhan, younger brother of Sarybai. The akyn himself remained with Sarybai, not daring to reveal his secret to him. At that time, the whole family of Aikym and the groom's relatives went off their feet searching for traces of fugitives. Finally, they found out that Burym was in the village of Sarybaya. This became an unpleasant surprise for the biy himself. Between the auls the negotiators began to frequent. They turned to Zhabai, the father of akyn. Zhabai sent his eldest son Taita to Sarybai. Biy called Zhambyl and demanded to return the girl. Only now the villages of the Ekeans have rallied. People Shapyrashty, finally, healed quietly. And I can not allow a new confrontation," said bi. Zhambyl resisted, but could not change anything. The word of the bi is the law. The brown was brought back to his native village. Soon she married another. Zhabai scolded his son, who put the family in a difficult situation. "It's disgrace our family!" - he said. - All that we have, could go to pay a fine. And Sarybai tried to reassure Zhambyl. "Do not grieve, dear," said Biy. "I saw the old man yesterday, he drove the herd." I asked to give me the best horse. He replied: "I can not. This is Suyunbai's gift to Zhambyl. " And then I woke up. It turned out that it was a dream. I called you to tell this dream. Suyunbay gave you his precious gift - the talent of akyn. With him you will find your happiness. Meanwhile, the spiritual wounds of the young akyn did not heal for a long time. But in the fall of 1876, one of the most mysterious events in the life of Zhambyl happened on the Kailara peninsula. He first saw a girl named Sarah from the Alban clan. In this girl, in her dazzling beauty rivaling the shining moon, he found the delight of his soul. Sara's song "Ay-ugai! ", combined with the national motive, became for Zhambyl a song of the heart for life. Yes, Sara and Zhambyl brought the song closer, they understood each other, they decided to join their lives. But Nurbek, the girl's father, was against marriage, forbade them to meet. He gave Sara a son for a bai. Unable to withstand the separation, Zhambyl went after her lover. They found an opportunity to meet. Sarah confessed that she spends her days in sorrow and sadness. Perhaps, having learned about the meeting, the jealous husband forbade her not only to sing, but also to appear in public, constantly beating her. In the end, Sara died in mental suffering. The sorrow of youth, the suffering of love deepened sensuality, added new colors to the compositions of the akyn. In the songs, poems, cuies came the theme of emotions and longing. The hidden thoughts tightened the veil of sadness. Two women's names akyn with special warmth recalled to the end of their days - Brown and Sarah. At the time of sorrows and contemplative state, Zhabai mated for a son a girl named Momyn from the Orynbet subgenus of the genus Zhanys. One of the daughters died in childhood, the other - Gultai - happily survived until the 1960s. During the years of famine, Zhambyl lost many relatives. Died in 1932 and Kozhak. Momyn died early. In the early 1880s, Koman, the younger brother of Zhambyl, had a son. And soon died Momyn. But then Coman himself passed away. His wife Ardan remained a widow. And according to the same law of immigration she was married to Zhambyl. Ardan gave birth to his son Akkula and daughter Akbal. Closer to forty years, Zhambyl fell in love with Kanymzhan from the Tleukabyl clan and, by her consent, took a wife. With Kanymzhan he met at a party in one of his trips to aityses. In her youth she sang well, although she did not compose songs herself. After becoming the wife of Zhambyl, Kanymzhan gave birth to the akyn of the sons Algaday, Shynibay (died in childhood), Iztileu and Tezekbay. Algadai and Iztileu took part in the Great Patriotic War, were killed by the death of the brave. In total, Zhambyl had eight sons and three daughters from three wives. In the second part of the book "Aesthetics of poetic lists" the author explains the etymology of the Kazakh word "akyn". The scientist Adyge Tursunov raises him to the ancient Türkic word "akun" in the meaning of "raid," "attack," "Barymta''. The main feature that distinguishes akyns from other types of carriers of the Kazakh oral and poetic tradition is precisely that of "attacking" each other in a poetic competition - aitys. Aitys is considered and has always been considered a measure of talent, an improvisational force of akyn. In aytys, it was impossible to leave unanswered the attacks of the opponent opponent and the questions he asked. It was to be witty, beautiful and without delay to argue, which often reminded one of the armed to the teeth of the soldiers by the heat. This required the Akyns to have special fighting qualities, which Zhambyl never forgot. According to the ancient rules of aytys, every akyn glorified nobles of a kind. But Zhambyl in an epic manner extolled the Batyrs of the Shapyrashty family, and not the rich, knowing full well that not only the rich people are famous for the Kazakh steppe. Heroic legends glorifying feats of the Batyrs were especially loved by the people and were remembered for centuries. Less often remembered odes in honor of relatives - wealthy 'bais'. However, Zhambyl returned to heroic epic not only from the desire to conquer the mass spectator and draw him to his side. He also, of course, figured out with the help of what arguments it is possible to defeat such a sophisticated veteran of the Akyn battle as his opponent Kulmbambet. After all, the main theme of the songs of Kulmbambet was precisely his enthralling and respecting inherent wealth of the bays, which was supposed to cause similar enthusiasm among the public and crush the young upstart Zhambyl. After the aitys, both akyns treated each other with special respect, kept good relations, glorified each other, to which there is much evidence of their contemporaries. In the first decades of the twentieth century, folk art was experiencing a deep crisis. Urban culture gradually took the dominant position, primarily in the political and social dimensions. The problems of public administration were solved by Russian officials, the Kazakh aul remained outside the political context, - the author of the book about Zhambyl emphasizes. - A few Kazakh officials played a subordinate role. However, it was their efforts that shook the traditional foundations of culture. As they merged into the city life, they quickly joined the opinion of the backwardness of the nomadic Kazakh society and ridiculed the traditions, considering, for example, the fun of the baits decaying from satiation. The aesthetic side of art fell out of their sight, the social role of akyns was deliberately understated. Traditional values ​​lost their former absolute strength, not least because of direct intervention by the administration in the cultural canons of nomads. At some point, the officials decided to transfer the akyns to the category of controlled artists. In the spring of 1913, the county administration assembled the Semirechye in the Verny Akyn, having conceived the original way to direct the art of Akyn to the right track. In the poem "My Life" Zhambyl recalled: "The activity of akyns was not left without attention of the powers that be. We collected all the akyns-zhirshes in the city in one big place and as if they were imprisoned." In 1916, Zhambyl turned seventy. Akyn increasingly thought about the past years, recalled the events of the past days. However, by the will of fate at a venerable age, he had to become a participant in grandiose events that shook the nomadic society. As the author of the book notes, Semirechye has turned into a major center of the Kazakh uprising against the Russian government. The reason for the uprising was the tsar's decree of June 25, 1916, "On requisition." It referred to the mobilization of the "alien" male population of Kazakhstan, Central Asia and part of Siberia in the age of nineteen to fourty threeyears inclusive for the work on the construction of defensive structures and military communications in the area of ​​the active army. The tsarist government wanted to free Russian soldiers and workers from building defensive structures and other rear services, replacing them with requisitioned foreigners. Those who did not obey the tsar's decree were cruelly punished. Being in the thick of events, Zhambyl could not remain indifferent to the grief of the people. The suffering of the heart was reflected in his songs. The people rose to fight. Armed with horrible inhabitants of the auls began to attack the representatives of the tsarist authorities. The local chancery and the houses of the volost administrators were set on fire. As a result, to suppress the unrest in Zhetysu, the tsarist government equipped a punitive expedition consisting of 2 battalions, 33 hundred, 42 guns and ninety seven machine-gun teams. By the end of the year the insurrection began to decline, then the defeat of the insurgents followed. All these stages of the struggle Zhambyl recorded for the story in "Song of an angry heart". Akyn helped the rebels with advice, inspired songs, always was close to the people. After the tragic events of 1916 in the Kazakh steppe, Zhambyl met news of revolutionary changes in Russia in 1917 with special hopes. The overthrow of the tsar and the arrival of the new government, naturally, were mediated by the expectations of improvements in the life of the Kazakhs. But beyond this, akyn cherished the secret hope of reviving the art of akyn, which in recent years of tsarism was experiencing an incredible crisis associated with the irreversible desire of the Russian administration to translate the nomadic Kazakhs to a settled way of life. And now, after the February revolution of 1917, the dual power of the Provisional Government and the Petrograd Soviet was established in Russia. In March Tsar Nicholas II abdicated from the throne. These events put an end to the practice of "requisitioning" Kazakhs for logistical work. Then, on October 25 in 1917, the October Revolution took place in Petrograd. The power in Russia was seized by the Bolsheviks. About the Great October Socialist Revolution Zhambyl sang many times until his death and always in sublime tones, glorifying in the romantic style not only October, but also the leaders of the revolution. The old man cheered up. Akyn took the dombra and mounted his horse. I began to travel around the aul, a guest from relatives, friends, acquaintances. He sang again, composed songs. Praising the new government, foretold her the role of intercessor for the Kazakh people. He sang about Marx and Lenin, singing about the republic's autonomy as a centuries-old dream of the people of independence. In the pre-war period, in the 1930s, Zhambyl began to suffer more often. At first he only laughed at the indisposition. Although the malaise did not let the old man go away for several days, he did not lose his presence of spirit or sense of humor. Life-loving was incorrigible. Here such records were made by Gali Ormanov in 1939. They give a clear idea of ​​the life style of the akyn. Striking, of course, its inexhaustible vitality and highest affinity with creativity. I could write songs every day, without interruption, even at night. Starfuries still got Zhambyl. He was sick, he was treated, he left the hospital and again got into the saddle. He sang, laughed, joked over himself, went through life from aul to aul, from event to event, and wrote songs amazing in purity and depth of thought, which then turned into verses in all-Union and republican newspapers and magazines and went to the people. Moreover, not only poems rigidly structured in the political mode of composition, like "Batyrs of our Motherland", were poems in honor of the text of the oath of soldiers of the Soviet Army and sailors published in the press, "The Congress of Winners" - by the opening day of the eighteenth Congress of the Communist Party of the Soviet Union" in connection with the fifth anniversary of the murder of Sergei Kirov, a politician. But there were also deeply lyrical works, humorous epigrams, beautiful and accurate landscape sketches. It was they who testified that the akyn was full of strength, creative plans, hopes. In March 1941, Zhambyl Zhabaev along with Lebedev-Kumach, Georgy Leonidze, Sergei Mikhalkov, Alexander Tvardovsky, received the Stalin Prize of the second degree with the formulation "for public works". This was the highest award in the Soviet Union for outstanding achievements in the field of literature and art in 1940-1954. He began to travel to the collective farm fields, where he sang singing couplets about labor ("Wealth of the Earth"). However, the fate awaited the akyna's new brutal upheavals, which he may have foreseen when he created antiwar war-cautions, but hoped that the flaring World War II would bypass his country, allow him, an old man, to live his own life alone. But it happened differently. On June 22, 1941, Hitlerite Germany attacked the Soviet Union without declaring war. The news of the beginning of the Great Patriotic War came to Zhambyl, when he was at the Zhaillyu Kulansaz. He immediately announced to the entourage that from now on he could not be sick, senile, or late walks over the Jailau. He must be with his songs in the ranks of the defenders of the Fatherland. A few days later he mounted his horse to return to the village. As Sabit Mukanov said, July 3, 1941 Zhambyl drove up to the house at a time when the radio broadcast the speech of Joseph Stalin. All the relatives of the akyn gathered before the loudspeaker. The same night the elder folded the song "At the hour when Stalin calls." On July 4 he sang it before the collective farmers. With simple and heartfelt words, he was able to reflect the feelings of anxiety of all Soviet people for his homeland, his readiness to stand up for her defense. Zhambyl followed the military reports, listened to the radio, angrily demanding from relatives that someone who knew the Russian language translate the words of the announcer. Typically translated literary secretaries. In this difficult time for the country, all resources, including creative ones, were mobilized to fight the enemy. It's time and Zhambyla. The leadership of the country and the republic decided to ask the akyn to support the creative work of the besieged Leningraders. They sent literary assistants to him. Newspapers and radio spread the words of fatherly love and the care of the old akyn, addressed to the defenders of Leningrad, throughout the vast expanse of our Motherland. They heard, read in the posters posted in the besieged city by the inhabitants of Leningrad, in front-line newspapers - its defenders. Fortitude, faith in the victory and strength of the peoples of our country awakened the words of Zhambyl in their hearts." In the besieged city, the Leningraders stopped silently at the wooden boards, on which bullets and announcements were usually fixed, and read the lines printed in large letters on the gray sheet, which could not be passed indifferently. Poems have also reached the front. Many eminent persons spoke about the power of this legendary work of akyn. The poet Vsevolod Rozhdestvensky noted: "In the most difficult days of the defense of Leningrad from the Nazi troops on the Fontanka and other avenues of the city, I saw posters with the text of the song Zhambyl" Leningrad, my children! ". This inspiring people to win the song will be remembered by anyone who has endured unbearable suffering from the inhumanity and cruelty of the fascists in the besieged city." The song of Zhambyl ''Leningrad people, my children!'' was printed on posters in big letters and hung out on the streets of the city. More than once how these people stood by their posters and cried. People witnessed how people lined up in the streets behind a newspaper with the song of Zhambyl and did not hurry to the bomb shelter even when German planes appeared and the bombing began." Many meanings contained this song of akyn. Zhambyl managed to link the centuries-old history of the city with the crystal clear poetic language with the spirit of the struggle that the whole country, all its peoples, lived in the most difficult time for the Leningraders. - Yes, it should have happened. My dream was fulfilled, you can die. Where is Satysh, where is Tezekbai? Let them lead me to the meeting. At a rally in honor of the Victory in the Great Patriotic War, Zhambyl sang a song-congratulation to the inhabitants of his village. This was the last song of akyn. On June 22, 1945 with the rising of the sun the akyn's heart stopped. After the death of the akyn, his tremendous popularity throughout the Soviet Union continued to really promote the friendship of the peoples of the country, regardless of the changing political situation. In his long life Zhambyl worked in different eras, under different regimes. And he always remained a real akyn - a talented poet-improviser, masterfully composed instant masterpieces of songs for almost any relevant topic, but he was also an impetuous and fearless truth-seeker, a brave defender of the poor, a brave and audacious exposer of the bearers of evil. As the author of the book notes, Zhambyl managed to fulfill the most important task of akyn at the outbreak of life. He supported the spirit of the people of a multinational and multimillion country at the most difficult moment in history, when the enemy, led by destructive instincts, stood at the gates of Leningrad and Moscow. Akyn created a poem-song "Leningradians, my children! ", Which undoubtedly supported the inhabitants of the blockaded city and the soldiers-defenders of the Fatherland. Perhaps, for the sake of realizing this mission, the Most High granted him so many years of life.